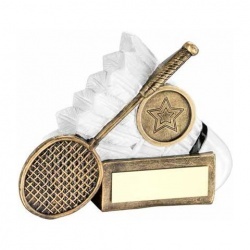 A selection of badminton trophies and awards, offered with text and logo engraving options. 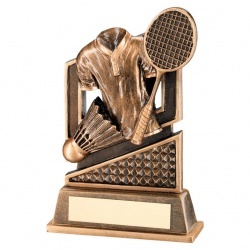 Resin badminton scene trophy, 4.25in tall, in bronze colour with white shuttlecock. Resin Badminton Theme Trophy on Base with Plaque. 5.5in tall. 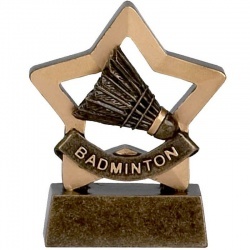 Resin badminton scene trophy, 3.25in tall, in bronze colour with white shuttlecock. Resin Badminton Theme Trophy on Base with Plaque. 4.75in tall. Resin badminton scene trophy, 2.75in tall, in bronze colour with white shuttlecock. Create your own personalised badminton trophy for your event or competition, or to recognise an achievement by a badminton player. These resin badminton trophies and wooden badminton awards can all be engraved on their engraving plaques. Click on any product image or title for full details and to buy online.